How can you measure the success of a company? Is it in dollars earned, the price of the stock, or how the company has changed the world? At BigSpeak, we like to think you can measure success by how many people you’ve touched over the years. So we’ve crunched the numbers to tell our story from our humble beginnings in 1995 in founder Jonathan Wygant’s garage to where we stand now in 2018 with over 30 employees changing millions of lives. While many businesses are proud to survive a year, it says something about a company, its leadership, and its people to survive two decades. 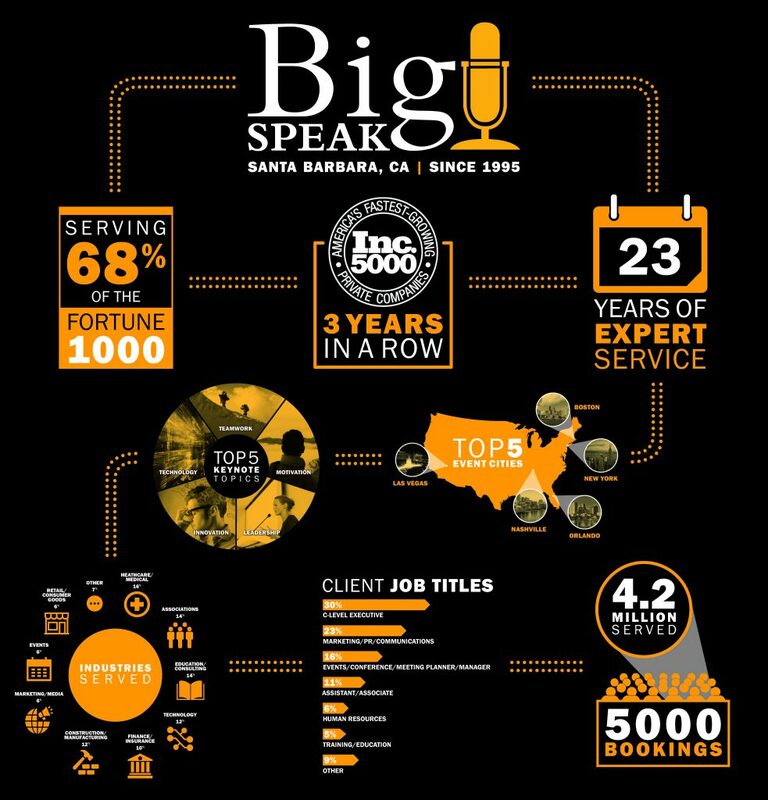 BigSpeak has weathered the dot.com bust, the Great Recession, the good times and the bad, and it’s still growing and thriving. At BigSpeak, our goal is to help companies improve by sharing ideas. It’s a testament to our longevity and our service that we have been trusted over 5,000 times and have reached over 4.2 million people at events, conferences, and workshops. We are truly humbled by the change we have helped bring to individuals and organizations. We proudly serve over two-thirds of the Fortune 1000. Successful companies from the U.S and around the world trust us to find inspiring speakers who can bring new ideas to supercharge their company to further success. Who do we serve in the Fortune 1000? At BigSpeak, companies from healthcare, education, finance, tech, retail and more trust us to find motivational speakers and thought leaders that apply to their specific circumstances. Whichever industry has a need for new ideas and a boost of motivation, we have the right speaker who can help. Over the years we proudly said we were a boutique company that’s small enough to care about you, but big enough to care for you. However, with our rapid growth over the past three years and the fact we employ twice as many people in Santa Barbara, we are no longer a boutique company. Thanks to all our happy clients, we are a small but growing company which has been recognized as one of the Inc 5000 fastest growing companies three years in a row. The Fortune 1000 companies most often focus on leadership, motivation, innovation, teamwork, and technology. But BigSpeak covers it all. Whatever topic is needed, we know a top thought leader, bestselling author, successful company founder, or big-name celebrity who can inspire their people to become better. Where do our speakers travel to? While BigSpeak speakers go everywhere and anywhere in the world (over 60 countries on six continents), the most popular cities for conferences and events happen to be Las Vegas, Orlando, Boston, Nashville, and New York. Who do we work with at your company? Well, we work with anyone who wants to book a speaker. But most often we help chief executives, marketing coordinators, event planners, and all their assistants find great speakers. Whatever the level, or whatever your experience, BigSpeak will reliably, expertly, and quickly guide you through the process.